For their weekend retreat, designer Mark Kennamer and architect Jason Robb crafted refined rooms where polish and comfort go hand in hand. The house, located in Silver Rock Cove, is one of only 94 homes in the development, which appealed to Mark and Jason. Additionally, the community includes a marina and two swimming pools. Once the pair purchased the house, they began the process of changing it up a bit to suit their tastes. The stained pine walls were painted white, instantly brightening the rooms, and the kitchen cabinets received a smart glossy blue makeover. “I really approached every decision with comfort in mind, and I didn’t want anything too formal, ” says Mark. The main living room’s blue-and-white palette also brought a fresh look to the space. “It does have a bit of a coastal attitude, which appeals to Jason since he grew up in Mobile, ” says Mark. The space has lots of seating options for entertaining, and many pieces are upholstered in practical but pretty Sunbrella fabrics and even lake-friendly vinyl. 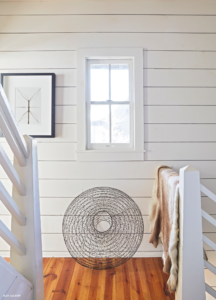 While the living room has some sophisticated notes, the original pine floors and painted shiplap walls impart a cottage feel, keeping the house grounded in its lakeside location. For his bedroom, Mark left color behind and embraced a neutral scheme with a statement-making iron canopy bed. The windows, dressed in sheer panels, soften and contribute to the soothing atmosphere. Jason’s bedroom leans masculine, anchored by a rich paisley Schumacher wallpaper that inspired the rest of the choices in the room. “I held on to a sample of that wallpaper for 20 years waiting for the perfect place to use it, ” says Mark. “Although it had been discontinued, there were enough rolls left to do the job.” A handsome striped Brunschwig & Fils fabric makes up the tall custom headboard, while the bedding is from Pottery Barn. “It really is a mix of high/low throughout the rooms, ” says Mark. 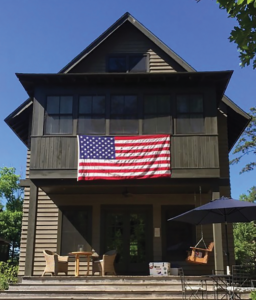 Now that the home reflects their style, Mark and Jason enjoy hosting neighborhood gatherings, especially in the fall while watching Auburn football. “We welcome the escape here, and we’ve made many friends at the lake, ” says Mark. “We tend to hang out in each other’s homes with everyone taking turns hosting.” Just one more easy aspect of lake life. 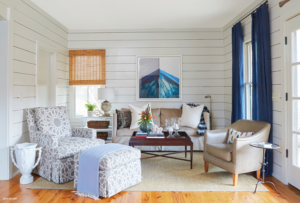 The crisp blue and white palette gives the main living space a fresh, Coastal feel. 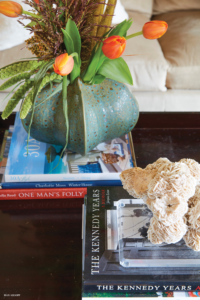 Mark chose simple accents such as blooms atop stacks of books. 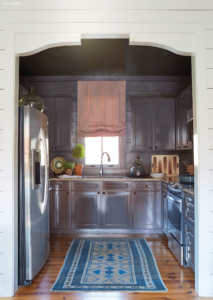 An unexpected blue hue adds interest to the small kitchen. A large wire crab trap greets guests going up to the third-floor loft space and hints at Jason’s childhood in Mobile and on the Alabama coast. Mark’s bedroom lends itself to the aura of escape with a pretty and soothing neutral palette punctuated by an iron canopy bed and gold antique mirror. An arrangement of leaves brings welcome fall color into the serene space. 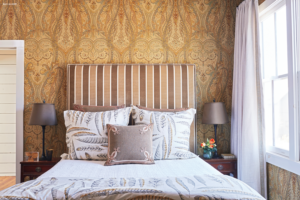 Jason’s bedroom takes on a more sophisticated tone with a palette of browns and golds. Life on the lake doesn’t slow down at summer’s end. 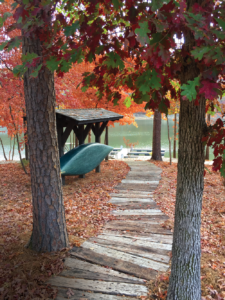 It beckons during every season, even throughout the cooler months. 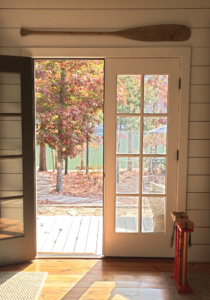 Picture windows on the second floor and a generous back porch make sure the lake is always in view.